Scarring from burns may be devastating to live with. For burn victims seeking burn scar treatment in the Miami, Ft. Lauderdale, Kendall, and other areas in South Florida, Miami Dermatology and Laser Institute provides the most advanced burn scar treatments under the leadership of Jill Waibel, MD, FACS, a board-certified dermatologist and specialist in scar revision treatment. 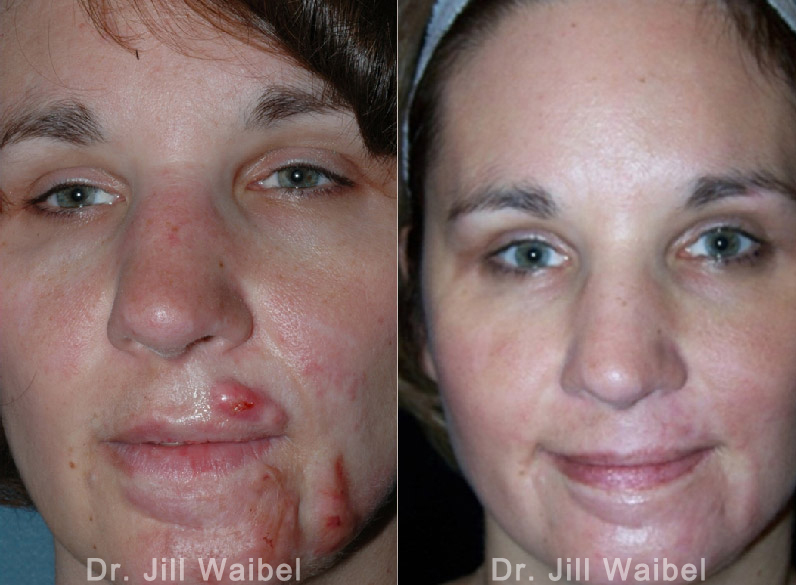 Dr. Jill Waibel is a leading dermatologic surgeon known for her extensive work treating patients who have suffered with burn and traumatic scars. Patients come to see her from all over the world with devastating and disfiguring scars to seek her advice and treatment. Burn scars create a host of aesthetic and functional challenges. Burns not only destroy tissue, but they also hamper the ability of remaining tissues to respond to some treatments such as lasers. Additionally, loss of underlying tissues often results in contracture, or tightening of the skin over the wound, which can cause pain and restrict motion. Post-burn scars usually develop a hypertrophic appearance – red, firm, raised and confined to the original wound’s borders. The complexity of severe burn scars requires a multifaceted approach that involves surgery and carefully selected and delivered laser therapies. What are the signs of a burn scar? Burn scars typically appear red and raised, and can be itchy and/or painful. Additionally, tissue contraction results in tightness of the overlying skin. Who is most susceptible to burn scars? Some of the most severe burn scarring affects soldiers returning from battle. The use of improvised explosive devices creates devastating wounds including burns. However, medical advances that have occurred over the past decade or so have meant that more soldiers are surviving these serious wounds, and need reconstructive and dermatologic treatments. 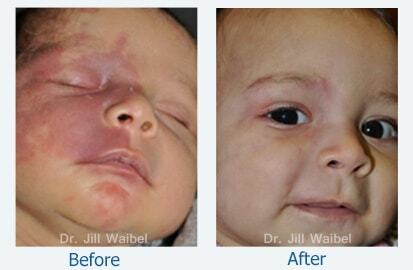 Proper post-burn care is also important to minimize scarring. Dr. Waibel has collaborated closely with military colleagues and works to help wounded members of our armed forces. After skin grafts and donor sites have healed, treatment focuses on maximizing wound healing. This requires proper hydration of the wound using water-based moisturizers and possibly silicone sheeting or other occlusive dressings. Compression garments are also commonly used in this phase. Research at Miami Dermatology and Laser Institute shows the sooner a scar is treated the better the results. Typically we recommend waiting until skin is intact (epithelized) and begin treatment about three months post-injury. Correcting excess tension across a burn wound may need laser and surgical procedures such as a Z-plasty, which uses a specific pattern of incisions to achieve functional and aesthetic improvements. Waiting a year for a scar to “mature” used to be the standard of care for burn scars. Now, based on research done at Miami Dermatology and Laser Institute, it is recommended to begin laser treatment as early as two to three months after the original injury. 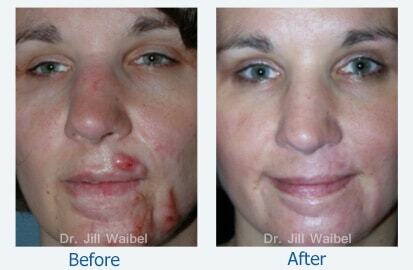 Fractional resurfacing can address discoloration, redness and textural irregularities. For thicker and contracture scars, ablative fractional resurfacing appears to be much more effective than non-ablative resurfacing. For red scars, your Miami Dermatology and Laser Institute dermatologist may also recommend lasers typically used to treat vascular issues, such as the pulsed dye or IPL laser. If you’re undergoing multiple modalities in a single visit, treatments are combined carefully to avoid excess thermal injury. Typically, treatments should be spaced at least six to eight weeks apart depending on the scar. Post-laser therapy may include applying dressings, such as a petrolatum-based ointment, immediately after laser treatment. Patients should leave the ointment on for one to two days, then continue applying petrolatum-based ointment until three to four days post-treatment, when the wound is epithelialized (covered with new skin). Patients with burn scars can undergo intralesional steroid therapy, which is usually done with triamcinolone, concurrent with laser therapy. Alternatively, applying a topical steroid immediately after fractional laser treatment allows the drug to diffuse into the pores created by the laser. Don’t wait to seek treatment to diminish the appearance of unsightly burn scars. If you live in Miami, Ft. Lauderdale, Kendall, or nearby vicinities in South Florida, contact Miami Dermatology and Laser Institute today to schedule an appointment with Dr. Jill Waibel to learn about your options for burn scar treatment.